Today was my first Peachtree Road Race. Apparently, I could not call myself an Atlantian until I ran the Peachtree. Well, guess I officially live in the ATL now. Atlanta is hot. Understatement of the century. And this race was H-O-T. Hot hot hot hot. Hot. I met Mountain Goat at her condo in Midtown around 7:00 this morning, with my fuel belt, my race number and a whole lot of questions. I was so thrilled when she hopped in the car wearing her Swim Bike Mom shirt. What a trooper. Especially since she has no kids. We hopped the MARTA train with about 1,000 of our closest pre-race friends. After a half mile walk, we end up at the porta-potties, where we waited for another twenty minutes. I was in line behind a grandfather and his two evil grandchildren (a boy and a girl, ages 8 and 9, probably) who did nothing but hit each other and kick at shins for twenty minutes: you stop touching me, stop it, quit it, Grandpa, she hit me! When Grandpa went in the porta potty, the boy pulled the girl’s braid so hard, I thought he would snap her neck. “Hey,” I said, “You are both going to go to timeout if you don’t stop that.” It came out of my mouth before I could stop it. The kids looked at me like I had slapped them across their faces. But they stopped, so that was good. Oh, it was so hot (I can’t emphasize this enough) and I was pouring sweat waiting for the race to start. Still, about ten minutes later we were running. Mountain Goat was g-o-n-e before I could say “have a good race,” but I settled in and was feeling pretty good. I must have missed the one mile mark, but I hit mile two before I knew what happened. I glanced down at my Garmin: 22:23… hey, that’s not terrible, I thought. Feeling okay. What a great gathering of people. I watched as the Statue of Liberty ran by, I passed a few ladies in sequined running skirts, and some women wearing mustaches (fake ones). I zoomed passed people, I was zoomed past, I paced with one girl most of the run. The spectators were encouraging and funny. I slowed down to watch one of the runners pull off to do a keg stand with a bunch of his frat brothers. Mmmmm…. beer…. At mile three (or so), I was feeling great. I ran through the Holy Water, and that’s when things started going downhill. Er, uphill. Pretty soon after, I saw the “Cardiac Hill” I was warned about. I pushed up and onward for as long I could take it. My lawd, I was so HOT. I ended up slowing down until I was at a ridiculous pace that could neither be called running or jogging, but was some sort of hybrid walk. I don’t remember much about miles four and five. I am not 100% sure I didn’t stop off and do a keg stand myself. I can’t swear to it. Before I knew it, mile six was approaching. I managed to knock off one of my fuel belt bottles, and I had to backtrack to find it. I really think it took me about thirty minutes to find it, and I was actually on Mountain Goat’s trail the whole time. Ha. I crossed the finish line at 1:15:15 (regardless of the fact that the Peachtree Results said 1:26:45 something… liars). I pressed “start” at the beginning on my Garmin and “stop” when I crossed the finish line… I’m not sure where I lost eleven minutes sayeth the Peachtree, but I am okay with a 1:15:15 time, and I am not okay with the other time. I mean, I did the run portion of St. Anthony’s in 1:14:59… I wouldn’t think I would been eleven minutes behind that (after a swim and a bike)… But what does it really matter? It doesn’t. I was glad to see the finish line, pick up my t-shirt, Popsicle and banana (and pose for some ridiculous finisher photos with Mountain Goat). I can’t wait for the Marathon Foto ones. We were in high gear post-race stupid. 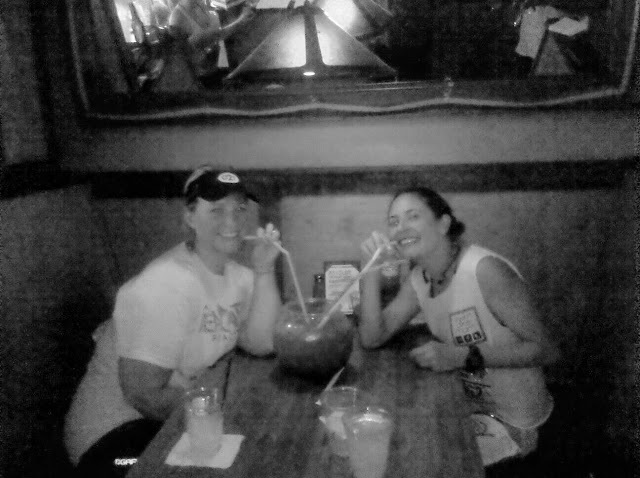 After a bit, we skipped on over to the Nook, a great little place near Piedmont Park, where we finally got a table and partook of a crazy fishbowl margaritaesque concoction. Yeah, that's my kind of day! Fun! Delicious looking drink too, yum. Congrats on a great race.